The Nmap aka Network Mapper is an open source and a very versatile tool for Linux system/network administrators. Nmap is used for exploring networks, perform security scans, network audit and finding open ports on remote machine. It scans for Live hosts, Operating systems, packet filters and open ports running on remote hosts. I’ll be covering most of NMAP usage in two different parts and this is the first part of nmap serious. Here in this setup, I have used two servers without firewall to test the working of the Nmap command. 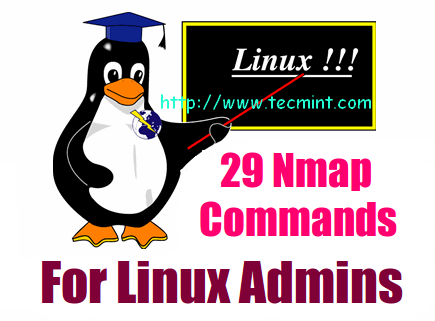 Most of the today’s Linux distributions like Red Hat, CentOS, Fedoro, Debian and Ubuntu have included Nmap in their default package management repositories called Yum and APT. The both tools are used to install and manage software packages and updates. To install Nmap on distribution specific use the following command. Once you’ve install latest nmap application, you can follow the example instructions provided in this article. The Nmap tool offers various methods to scan a system. In this example, I am performing a scan using hostname as server2.tecmint.com to find out all open ports, services and MAC address on the system. You can see that the below command with “-v” option is giving more detailed information about the remote machine. The SYN Stealth Scan took 0.30s to scan 1680 total ports. Host server2.tecmint.com (192.168.0.101) appears to be up ... good. You can scan multiple hosts by simply writing their IP addresses or hostnames with Nmap. You can scan a whole subnet or IP range with Nmap by providing * wildcard with it. On above output you can see that nmap scanned a whole subnet and gave the information about those hosts which are Up in the Network. You can perform scans on multiple IP address by simple specifying last octet of IP address. For example, here I performing a scan on IP addresses 192.168.0.101, 192.168.0.102 and 192.168.0.103. If you have more hosts to scan and all host details are written in a file , you can directly ask nmap to read that file and perform scans. Let’s see how to do that. Create a text file called “nmaptest.txt” and define all the IP addresses or hostname of the server that you want to do a scan. Next, run the following command with “iL” option with nmap command to scan all listed IP address in the file. You can specify an IP range while performing scan with Nmap. You can exclude some hosts while performing a full network scan or when you are scanning with wildcards with “–exclude” option. With Nmap, you can detect which OS and version is running on the remote host. To enable OS & version detection, script scanning and traceroute, we can use “-A” option with NMAP. In above Output, you can see that nmap is came up with TCP/IP fingerprint of the OS running on remote hosts and being more specific about the port and services running on the remote hosts. Use the option “-O” and “-osscan-guess” also helps to discover OS information. The below command will perform a scan on a remote host to detect if any packet filters or Firewall is used by host. To scan a host if it is protected by any packet filtering software or Firewalls. With the help of “-sP” option we can simply check which hosts are live and up in Network, with this option nmap skips port detection and other things. Host server1.tecmint.com (192.168.0.100) appears to be up. Host server2.tecmint.com (192.168.0.101) appears to be up. You can perform a fast scan with “-F” option to scans for the ports listed in the nmap-services files and leaves all other ports. You can find out Nmap version you are running on your machine with “-V” option. Use the “-r” flag to don’t randomize. You can find out host interface and route information with nmap by using “–iflist” option. In above output, you can see that map is listing interfaces attached to your system and their respective routes. There are various options to discover ports on remote machine with Nmap. You can specify the port you want nmap to scan with “-p” option, by default nmap scans only TCP ports. You can also specify specific port types and numbers with nmap to scan. You can also scan multiple ports using option “-p“. You can scan ports with ranges using expressions. We can find out service’s versions which are running on remote hosts with “-sV” option. Sometimes packet filtering firewalls blocks standard ICMP ping requests, in that case, we can use TCP ACK and TCP Syn methods to scan remote hosts. That’s it with NMAP for now, I’ll be coming up more creative options of NMAP in our second part of this serious. Till then, stay tuned with us and don’t forget to share your valuable comments. This article was very helpful! Thanks for taking the time to write this. I am on Linux platform with MySQL NDB 5.7. I am trying to monitor all traffic related to MySQL clustering – between data nodes, management node and sql nodes. To that end, I used netstat to list all open ports listening on my machine before starting MySQL cluster. Then, I started MySQL cluster and ran netstat again. I assumed that the ports that were listening the second time around, but not the first time, were related to MySQL clustering. What is the best way to go about finding all ports being used by MySQL for clustering purposes? I believe ephemeral ports are picked dynamically, so perhaps if I knew all the MySQL clustering related processes that would be running, I can figure out every port that they are using. Pointers will be very welcome. Good article, but using a version of Nmap many versions behind. Also should review the NSE ( NMAP SCRIPTING ENGINE) , very powerful. Version 7 of nmap brings a lot of interesting features to the table. Thanks for updating about NSE (NMAP SCRIPTING ENGINE).. never heard about it…Let me check and see what kind of other features its provides than standard Nmap..